Jhansi located on the banks of Pahujor Pushpawati River, is a historical city situated in the state of Uttar Pradesh is a symbol of bravery, courage and self respect. The original city was enclosed in the ramparts of the city walls but has now grown considerably. This city is spread over the area of 14 sq. km and is famous for its architectural heritage. 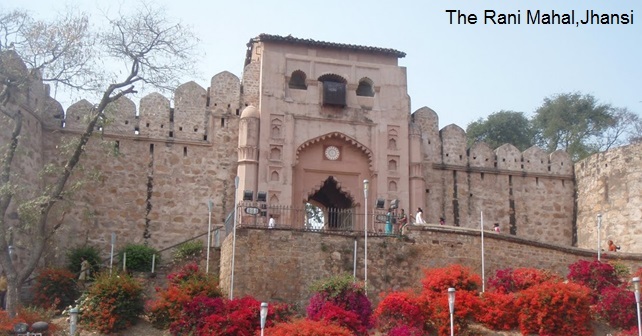 Jhansi Fort is one of the major attractions of Jhansi which was constructed by Raja Bir Singh on the top of a steep hillock and was meant for housing his troops and military equipments. Today, there is a museum which houses an elaborate collection of arms and some belongings of the royal personages which provides an insight into the history of Bundelkhand. Jhansi is also known as the gateway to Bundelkhand and is very well connected to all the major cities like Kanpur and Lucknow by many national highways like NH-12A, NH-25, etc. Jhansi is connected by railways to all parts of the country. The nearest airport to Jhansi is Gwalior airport which is located at a distance of 115 km from Jhansi. The Rani of Jhansi (19 November 1828 � 18 June 1858), born as Manikarnika and renamed Lakshmibai in 1842, was the queen of the Maratha-ruled Jhansi State, situated in the north-central part of India. She was one of the leading figures of the Indian Rebellion of 1857 and became for Indian nationalists a symbol of resistance to British rule. Various attractions in Jhansi are: Rani Mahal,Jhansi Fort,Maha Lakshmi Temple,Jhansi Mahaotsav,Maharaja Gangadhar Rao ki Chathri,Barua Sagar,Ganesh Mandir,Government Museum,St Jude's Shrine etc.Best time to Visit Jhansi is October - March.